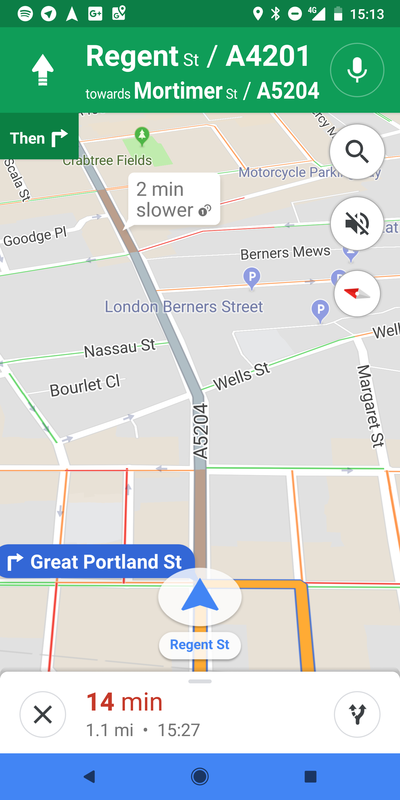 After looking through the latest Auto update, I haven't spotted any changes in either the car or phone interface, but there are some clues that suggest we can probably look forward to seeing improved functionality on the main screen. When Auto first launched, there wasn't much in the way of variations for the types of cards that might appear in the stream. You might get a Play/Pause button on the music app, a button to play a text message, and buttons to accept or decline a call. Over time, a couple of new formats came along like the "I'm driving right now" button for messaging apps. Now it looks like there may be some renewed focus on secondary actions as several new layouts were added. I've looked at the layouts, but they don't really betray anything specific about what might be coming. In all likelihood, the Auto team is laying the groundwork by creating semi-generic layouts for use by various apps and card types, which would make it easier to build new features. I know, it's not the most exciting thing to say, but as an Auto user, I'm always happy to see even early signs that new things are coming. 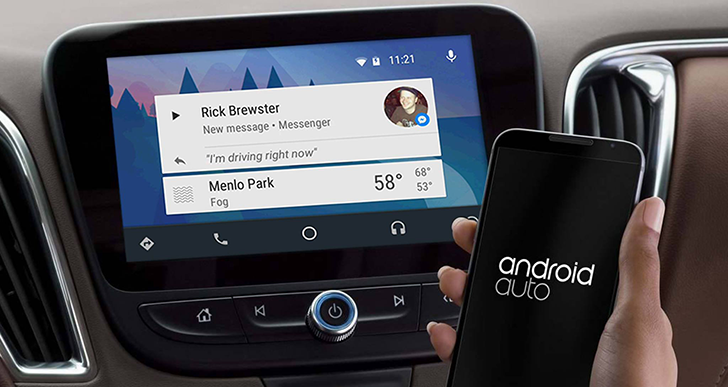 A teardown of Android Auto v3.1 revealed that it may begin showing message previews. It should come as no surprise that the resulting discussion was...controversial. All the same, a small addition answers the two biggest questions regarding implementation: Users will only see previews when they are stopped, and only the first line of text can be shown. As an additional point, it looks like the format for the preview will probably include the sender's name, leaving even less room for the body. My hunch is that any message longer than a handful of short words will be clipped. To me, this sounds perfect for one-word responses, a gate code, or the beginning of a street address. I know it seems a bit late to cover stuff from two whole versions ago (the current release is v3.19), but this stuff missed the v3.18 teardown and there wasn't much in last week's release of v3.19 to report (see below for that). Hey, Update Notes is all about catching the stuff that slipped through the cracks. You can share pics and videos to another app to save them to your device, but Photos doesn't actually let you save files directly. However, there's new text asking for permission to write to your Download folder, and it looks like Photos may be adding the ability to directly send files there for another option to store pictures and videos. Update: It looks like there's something a bit odd going on here. The Photos app does allow for saving files locally with the Save to Device command in the overflow menu, but they go to the /DCIM/Restored/ path instead of the Download folder. It's possible this permission request is just inaccurately worded, or it might mean those files will soon go to the Download folder instead. Either way, this isn't very interesting. Another storage-related topic came up with this update, though it's a bit more ambitious. It looks like there might be an option to pull down a copy of your whole library if you like. Obviously, this will take quite a while if there's a lot of data stowed away on Google's servers, and it might not work well if you're trying to download everything to a phone with relatively little free space. Three new notification channel titles have been added to the strings, but they don't seem to have gone live yet. See, I said there wasn't much to report here. 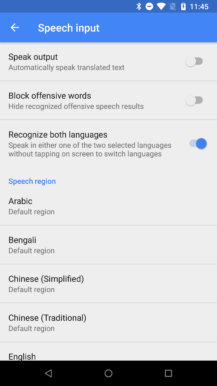 The latest update to the Google app came out with a fairly universal release of the At a glance widget, and there were a few smaller teardown topics to cover. However, there was one interesting addition that didn't make it in. 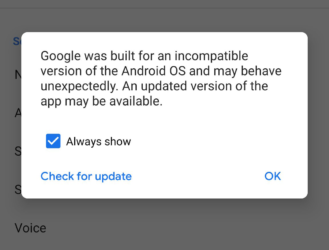 If you happen to be running the Android P Developer Preview, you'll have probably seen this dialog popping up to say that the Google app doesn't really see it as a compatible version of the Android OS. 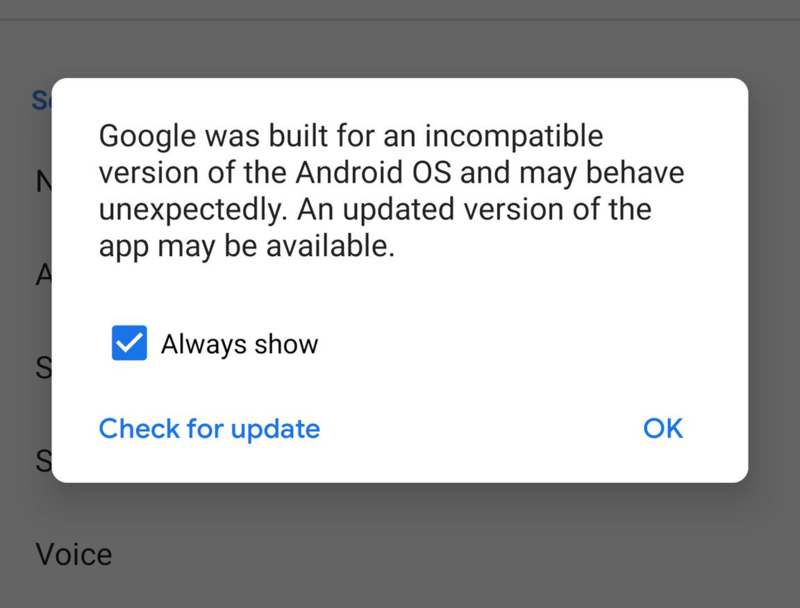 It obviously still runs fine, but this is an amusing oversight when 100% of the software is provided by Google. – Thanks, Stanzilla. Some users have been spotting a round border around buttons in navigation mode. I don't see this on any phones, so it seems safe to assume it's probably an A/B test and you may or may not be seeing it on yours. – Thanks, Zachary Kew-Denniss. 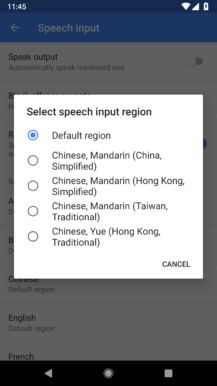 It's a small thing, but the Chinese Simplified and Traditional "regions" were merged together into a single option. We've already covered the meat of the first version of Tasks, and a teardown revealed very little that wasn't already live. In fact, the only notable thing to add is that the app will eventually use some amount of location awareness. The current permission request text explains that it's about providing more relevant suggestions, but hopefully that means Tasks will also use some geofencing tricks to begin reminding users to take care of todo items the next time they're at a grocery store or stopping at a mall. There are really only two things to note in this update. 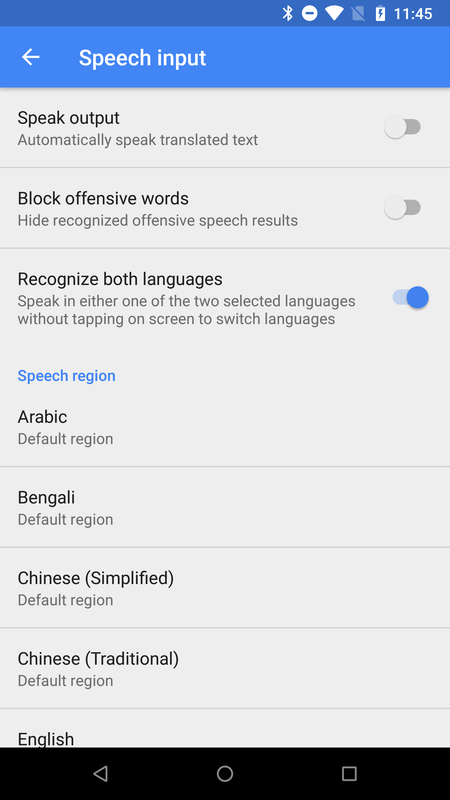 The first is a trivial update to the text so instances of the words "Android Wear" will now read "Wear OS" with respect to the recent rebranding. 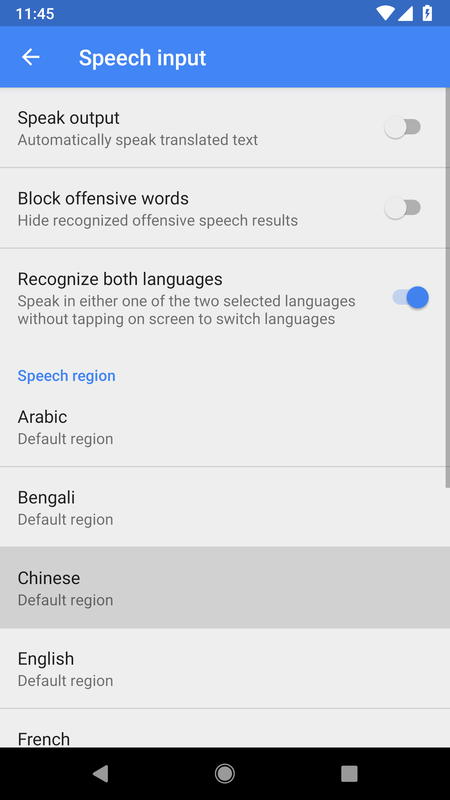 The other change in this update is probably not going to interest most people, but if you care about privacy, this might be right up your alley. A new section is now in Play Music's Settings screen for privacy and location options. 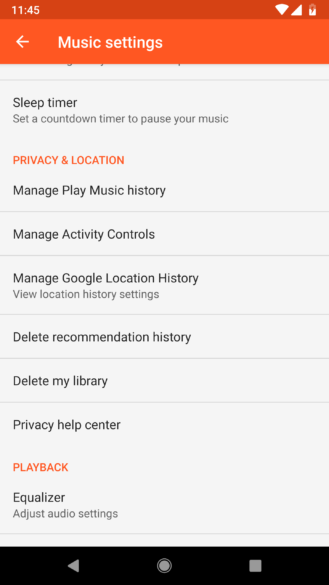 A couple of these options, managing music history and location history, were present in the older versions, but most of these options are technically new. 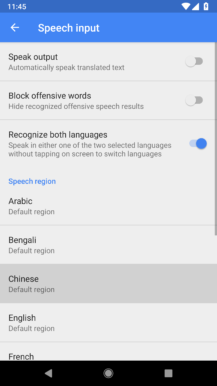 Of course, if you've used any other Google app, half of the other options are also pretty familiar because they're the same shortcuts to Google's profile pages. This section was probably added for the sake of compliance with the GDPR guidelines in the EU. 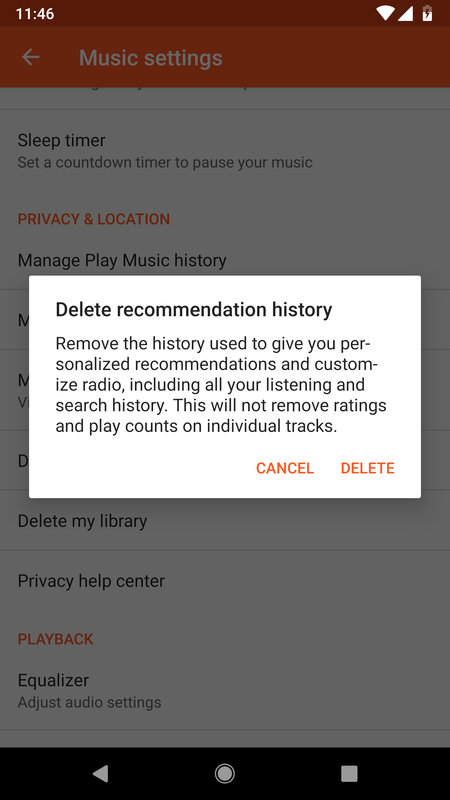 The only things that are actually new are the two 'delete' commands, which can remove your recommendation history or your library. 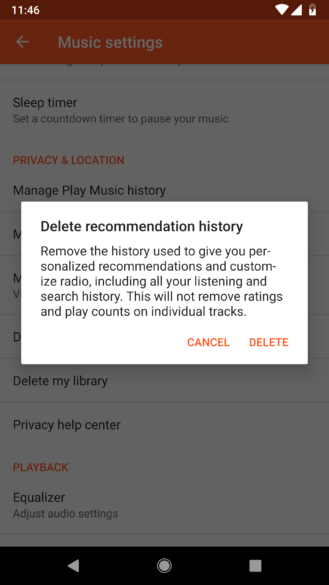 If you delete the recommendation history, the changes won't take effect until the app restarts.